June 6, 2018 | Matt Gooding & filed under Sponsored Events. 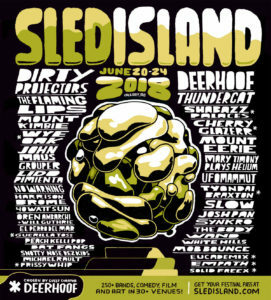 Sled Island is growing and about to burst all over Calgary for five days from June 20 to June 24. Discover over 250 bands, comedy film and art in more than 30 venues across the city. This year’s festival features guest curator Deerhoof, experimental indie pop titan Dirty Projectors, veteran psychedelic act The Flaming Lips, bass-wielding funk warrior Thundercat, live electronics masters Mount Kimbie, versatile indie-rock duo Wye Oak and many more. Also, make sure to catch the CJSR-presented show at Broken City on Saturday, June 23, featuring Wand, Faith Healer, Hot Garbage, and Sleepkit.